” President Donald Trump’s Week 5 in Office – February 20 – 24, 2017 – In Real Trouble or Not ? ” – February 25, 2017. 1. Lt Gen HR McMaster, a widely acknowledged military strategist, has been named the National Security Adviser. “He is a man of tremendous talent, a man of tremendous experience.” said the President. 2. Secretary of State, Rex Tillerson, and Homeland Security Secretary, John Kelly, officially visit Mexico. 3. “No more mass deportations or military force” – assure U.S. officials to Mexico. 4. President Donald Trump reverses Obama ban on private prisons. 5. U.S. Treasury Secretary assures that “Tax Reform” will be passed by August. 6. GOP Town Hall protests happen in many cities. 7. President Donald Trump aims at one of the greatest military build ups for America. 8. White House communication with FBI seen as not being held by custom and more in the nature of influencing the moves ( reports of conversations between Trump aides and Russian officials during the election campaign ). 9. 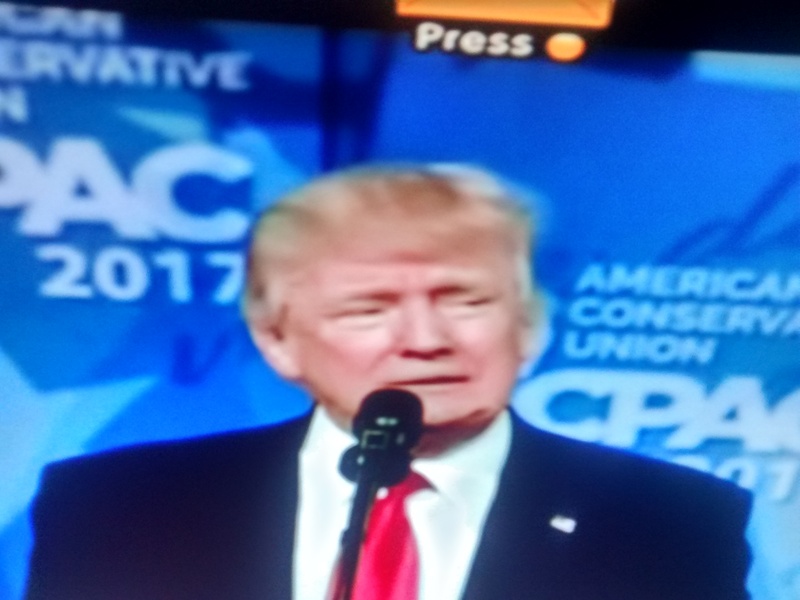 President Donald Trump’s speech at CPAC on ‘Reclaiming America’s Promises’ perceived to be much in the style of a Campaign Speech and not so much as expected of a President. 10. Policy on transgender bathrooms in schools is a State responsibility, says President Donald Trump. Let me briefly cite a few of my observations now giving a commonsense perspective for the discerning enthusiasts. A. The combination of two highly distinguished “M”some , Gen McMaster,NSA, and Gen Mattis, Defense Secretary, portends an excellent omen for the conduct of the Security & Defence affairs. There could possibly be some vibrations in their approach to normalise relations, just as we experience vibrations in tidal patterns or sound waves. But like the ‘Mountainous’ strength and ‘Multiple’ talent combining to form a mighty force protecting the Motherland, the awesome twosome will negotiate, maneuver, and overcome the barriers to peaceful solution. This is the expectation. Their jobs have just begun. B. Secretary of State, Rex Tillerson, and Homeland Security Secretary, John Kelly in Mexico – Their main effort is to rectify and remedy the impact of bold pronouncements of President Donald Trump in terms of stringent deportation moves, and building the wall in the southern border. Patching the troubles that have taken roots in terms of strong Mexican resistance is a priority. Shifting a bit from the ideals, and sticking to the vitals in terms of regulating illegal immigration ensuring safety of people will possibly be the central theme. It is also extremely important not to be seen as meddling in one another’s internal affairs while preserving the economic, trade, and business cooperation. The meeting, however, can now at best be described as ‘friendship consolidation’. Whether they can get the Mexican government have their way in the weeks/months to come will be watched. C. GOP Town Hall protests were reminescent of the Tea Party Organization activists in 2009. Eventhough the present protests are likened to them, there is a distinct difference that cannot be missed. Barack Obama’s actions in 2008-2009 connote an assuagement of the immediate financial ills, and protection of people from overpowering devastation. Stimulus approval to tide over the crisis was a relatively simple and easy quickfix. President Donald Trump acquired, according to his own words, “a mess”, a different kind of social, ethnic, and racial challenge which does not lend itself to any single effective solution. Hence the challenge of this day is more complex and relatively longterm requiring people participation in a big way. 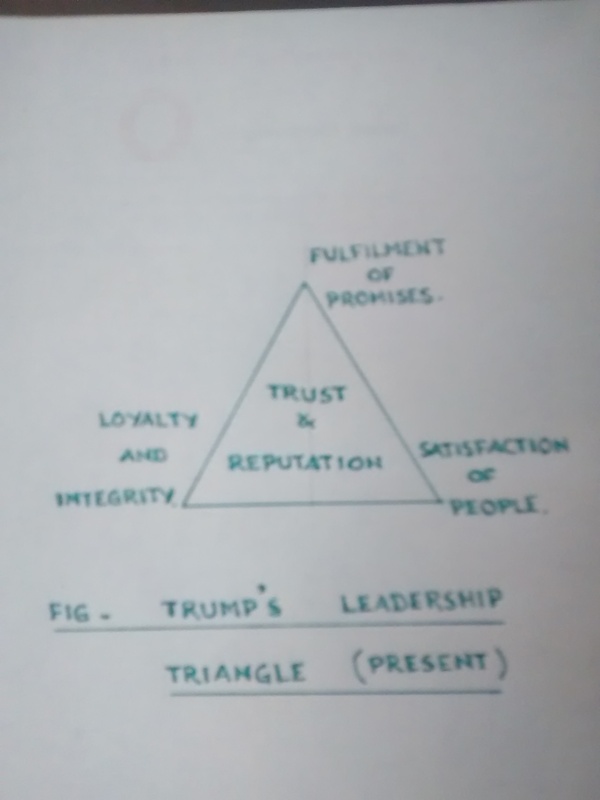 The figure below represents President Donald Trump’s strategy to enhance the ” trust” and “reputation” critical to mark his leadership. President Donald Trump seems to hold the strong conviction that swift actions on his election promises is the right path to garnering people support and enhanced image. His model leading to the satisfaction of people and securing their loyalty while invoking his own integrity may not be new, but the circumstances he finds himself in ( lack of government experience, candid outbursts, growing pain & discontentment of policy implementation … ) may well stand in goodstead specially in the long run. People may want to give more time for his acclimatisation process, bearing the glitches. For a presidential candidate who won on the plank of his promise of changing the Washington culture, it is important that this is perceived as the most alluring and effective route to tread on. That most polls do not substantiate his strategy and portray his unfavorableness even more prominently has not made any dent in either the President’s resolve or the strength of his constituency. If companies like Apple, Google, Microsoft, Ford, Chrysler .. stand firm and committed to bringing more jobs to America as the President claims, the spellful momentum that may accrue cannot be dismissed easily. What this would mean for Americans as a whole unit, and whether this will indicate a real trend of moving forward is unclear at this juncture. Is the President in real trouble or not is now the question. Tidbit : ” Many men owe their grandeur of their lives to their tremendous difficulties “.